Home Why become a member? To jointly represent the economic, social and professional interests of the companies that import machine tools and manufacturing technologies before the Public Administrations, organizations and exhibitions of the sector. To develop and disseminate strategic sector information and reports for the activities of our members and the machine tool sector. 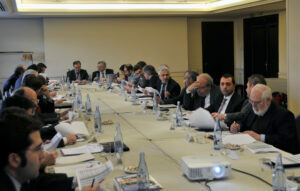 To participate and collaborate with other Associations of the machine-tool and industry 4.0 sector. To encourage contact, support and collaboration among partners as well as other professionals, sharing experiences, knowledge and synergies. To benefit from preferential conditions through the agreements signed by the Association with different public bodies and private companies. To promote and disseminate the principles contained in the association’s code of conduct. To guide our members in case of conflict in the exercise and development of their activity.